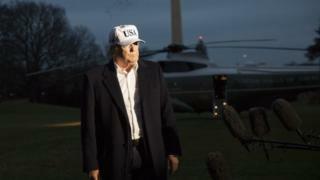 President Donald Trump has denied he is planning to fire special counsel Robert Mueller, who is investigating possible Russian meddling in the 2016 election. Tensions have been rising between the White House and Mr Mueller's probe. On Saturday a lawyer for Mr Trump's presidential transition group said thousands of emails had been unlawfully obtained by Mr Mueller's team. Responding to questions over the legal row, Mr Trump said it was "not looking good" and his people were "very upset". "I can't imagine there's anything on them, frankly, because, as we said, there's no collusion," he said, while returning from a weekend trip to Camp David. His administration has denied working with Russia in the 2016 election and Mr Trump has labelled the investigation "a witch hunt". 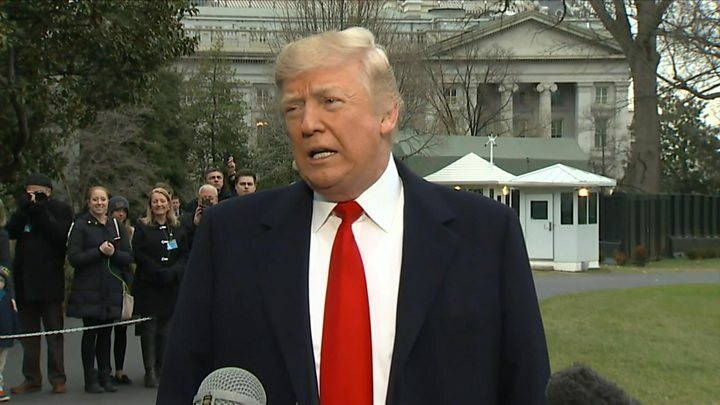 Responding to a media question on the White House lawn on whether he was considering firing Mr Mueller amid his criticism, Mr Trump responded "No, I'm not." Several Democratic lawmakers had expressed concern, and on Friday the top Democrat on the House intelligence committee, Adam Schiff, said he feared Republican members wanted to shut the probe down. Several former members of Mr Trump's campaign team are facing charges as part of the investigation. What is the issue with the emails? A lawyer working for the Trump for America (TFA) group, who helped Donald Trump's transition to the White House after his election, complained on Saturday after the group became aware Mr Mueller's investigation had obtained tens of thousands of their emails. Kory Langhofer sent a letter to US congressional committees claiming the records had been obtained "unlawfully". The TFA group had used the facilities, including email hosting, of a government agency, the General Services Administration (GSA), in the period between Donald Trump's election in November 2016 and inauguration in January. In his letter, Mr Langhofer, says GSA staff "unlawfully produced TFA's private materials, including privileged communications" to Mr Mueller's investigation team. The GSA, he complains, "did not own or control the records in question" and maintains the constitutional rights of transition officials were violated. A spokesperson for Mr Mueller said they had done nothing wrong. "When we have obtained emails in the course of our ongoing criminal investigation, we have secured either the account owner's consent or appropriate criminal process," Peter Carr said. GSA Deputy Counsel Lenny Loewentritt has denied another of Mr Langhofer's accusations, that the GSA gave assurances that requests for Trump transition records would go through the group's lawyers. He told BuzzFeed that the transition group knew materials would have to be provided to law enforcement "therefore, no expectation of privacy can be assumed". Democratic Representative Eric Swalwell tweeted that the accusations were "another attempt to discredit Mueller as his #TrumpRussia probe tightens". What has the Mueller inquiry established so far? US intelligence agencies believe Moscow tried to tip the presidential election in favour of Mr Trump - a charge denied by both Russia and the US president. Mr Trump has labelled Mr Mueller's investigation a "witch hunt" while other Republicans accuse it of bias. Earlier this month, Mr Flynn became the most senior Trump official to be charged as part of the inquiry after admitting making false statements to the FBI about meetings with Russia's ambassador. He has confirmed he is now co-operating with the investigation. In October, Mr Trump's former campaign manager, Paul Manafort, and his business associate Rick Gates were accused of conspiring to defraud the US in dealings with Ukraine. Both deny the charges, which centre on relations with a former Ukrainian president who was very close to Russia. President Trump's private lawyers are expected to meet Mr Mueller and members of his team next week to discuss the next phases of the inquiry, US media report. Who is in the drama to end all dramas? What is Robert Mueller tasked with?